This hint comes from Keith Blaylock, who participated in our panel presentation on Raising Chickens and Rabbits, and gave a wonderful presentation on Making Beer at Home. Rub the light papery skin off the cloves. 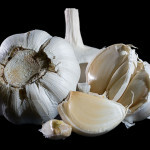 Shake the pot vigorously for 30 seconds, then open the pot to see your garlic cloves are completely peeled! Most of the peels stick to the pot so you can pour the whole cloves out onto the cutting board. This process does not appear to bruise the cloves at all. Discard peels into compost bin and you are done!